Lowell Town Hall is located at 501 East Main Street, Lowell, IN 46356; phone: 219-696-7794. Photo: Melvin A. Halstead House, ca. 1850, 201 East Main Street, Lowell, IN. 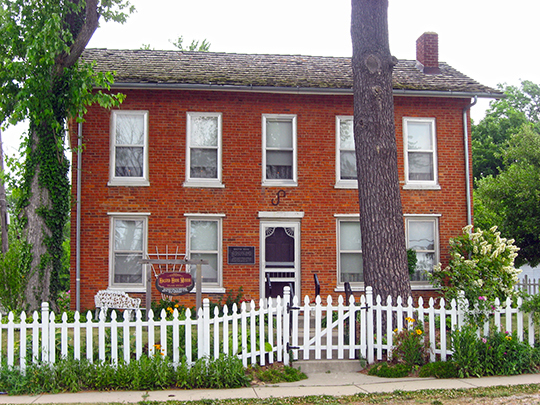 Listed on the National Register of Historic Places in 1978. Photographed by User:Nyttend (own work), 2011, [cc0-by-1.0 (creativecommons.org/publicdomain/zero/1.0/deed.en], via Wikimedia Commons, accessed November, 2012. 1848—M.A. Halstead erects a saw mill on the property known as "Mill Seat"
1853—M. A. Halstead constructs a flour mill (located on Jefferson Street); the mill was powered by water from the dam located on Main Street and was in use for approximately fifteen years. 1855—A clothing and general store was opened on Commercial Ave.
1860—Perry Clark opened a brickyard on the north side of Main Street. 1869—First Town Marshall was appointed. 1898—On October 4th a fire destroyed many Lowell businesses on the north side of Commercial Ave.
Ball State University Community Based Projects for the Town of Lowell, Town of Lowell Comprehensive Plan, 0000, www.lowell.net, accessed April, 2014.